Declining server populations in the Asia-Pacific have convinced BioWare to shift players to another location. 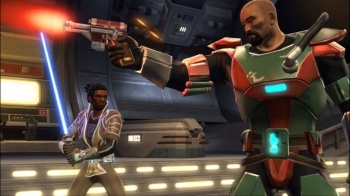 In the face of falling subscriber numbers, Star Wars: The Old Republic decided to make the switch to a free-to-play model, which reportedly earned it an extra two million new players. However, several players on the game's Asia-Pacific and Oceanic servers still expressed concern at dwindling player populations compared to other servers in the game. In response, BioWare has decided to close servers in the Asia-Pacific and resettle players into North America servers. Community manager Eric Musco explained the decision on the game's forums. The team had received several suggestions on ways to move forward, including transferring players to other servers with a higher population and merging all three existing servers into a single Asia-Pacific server. "However, the one common theme from the suggestions, which we heard clearly, is that everyone wants the opportunity to play on higher populated servers," Musco said. "With this in mind, we have evaluated all of the options and determined that the best solution, that will offer the best long term play experience, is to merge the APAC servers with higher populated North American servers." BioWare decided to forego the server-consolidation idea after considering that some players would need to adapt to a different play style (PvE or PvP) if everyone were to connect to a single server. Musco added that focusing players on North American servers "better delivers on our ultimate goal of providing the best play experience, with the most possible players, long term". In addition, BioWare will also perform some updates to the server merge technology, after which the Asia-Pacific servers will be merged into their North American equivalents. Musco provided no definite time frames for the move; however, he stresses that there is "quite a bit of work to do to make this happen".